Some people think that decorated collars are only beautiful, but their quality leaves much to be desired. Maybe they are right, but this thought is not connected with products in our company. Those who have already tried our tools are thankful for supplying them with the highest quality equipment, stylish at the same time. It is not so difficult to create a perfect collar, if you love your job. Our artists put their whole hearts in the products they are working at. Every collar is a real masterpiece. You can find painted, decorated with different kinds of adornments, or classic ones. 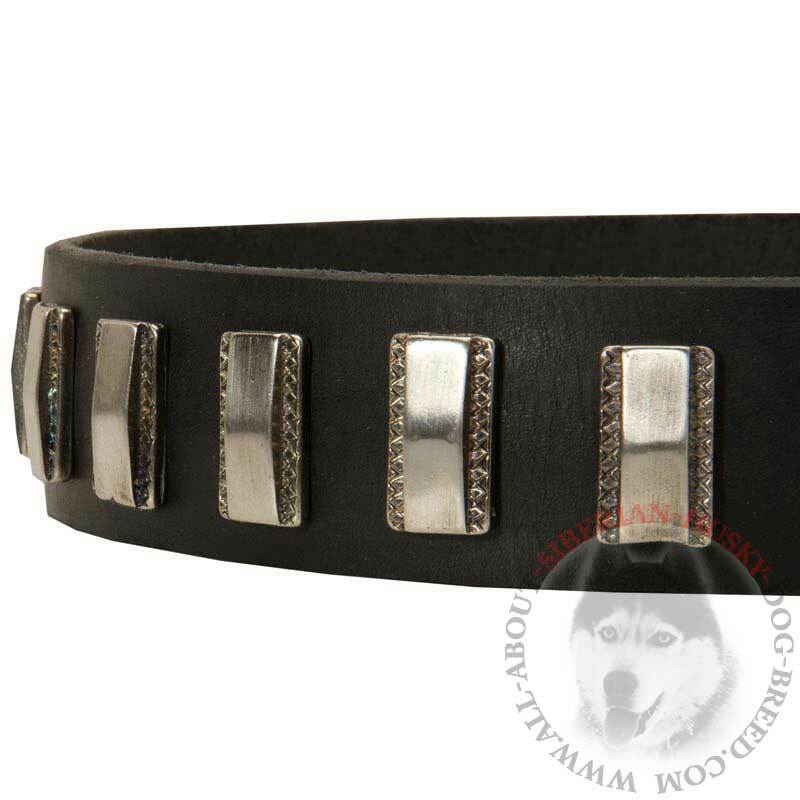 Today we present you gorgeous leather collar with nickel plates. This tool is totally handmade. Handiwork is always in vogue and people all over the world appreciate it. If you get it, you will have a chance to boast of having such a tool on your Siberian Husky. There is nothing better for an experienced dog breeder than to walk with a posh dog and to notice admirable looks of all passers-by. We are sure you have already dreamt of it. Now you have an excellent opportunity to make them come true. We offer you practical collar. 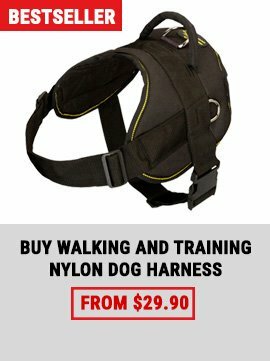 You can wear it on your Siberian Husky while training, walking, socialization and other dog activities. There is no need to buy several items that will suit various activities. Now you have feature-rich gear and save both time and money. This timeproof implement will serve you for years and will be like new one. Do you know the secret? 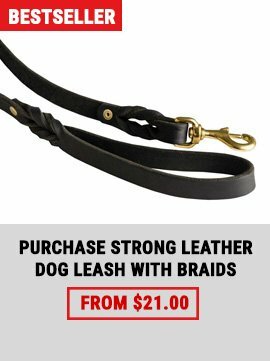 It is royal quality leather that makes this product super durable. No breaking, cracking or discoloration. We guarantee you these, but remember that leather demands proper maintenance. If you care about the collar correctly, it will be used without signs of wear and tear. Over time, even without getting wet by water, the collar can be damaged by oil presented in dog’s fur. To prevent breaking, please, clean the gear regularly. It will do good not only to the collat, but also to the dog as well. If your dog collar is wet, please take it off from his neck immediately and lay it in flat cool place away from direct sunlight. Also remember that using things as fan or radiator is a bad idea. Of course, it will speed the process of drying, but its damage will be even larger than moister you are trying to get rid of. You can prolong the life of collar keeping it away from water and direct sunlight. 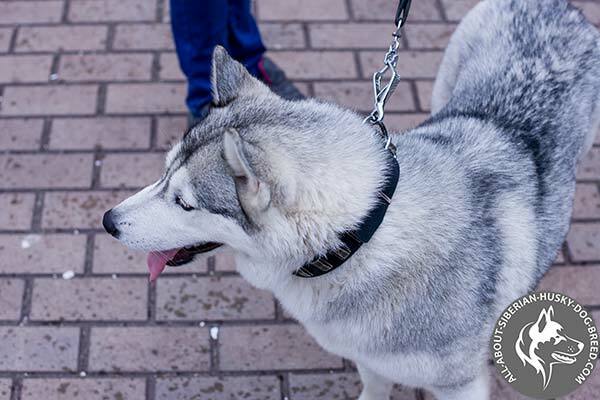 If you are going to swim with your Siberian Husky, or to let him play in the rain, you should take the collar off your pet until he is dry again. Also chemicals that are not intended for leather maintenance should not be used while cleaning. Leather is a gentle material. It can’t be used in any weather and climate. Extreme climate conditions like very cold, very cold, very dry and very humid can do a great damage to the collar. In this case small amount of conditioners and sprays can be used to prevent leather from getting it too hard or too soft. 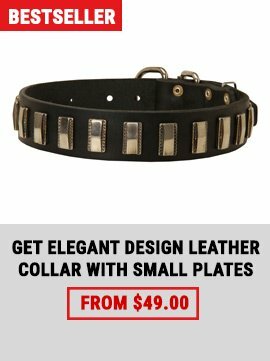 Follow this advice and this collar, as any other leather product, will be pleasing to the eye for years. 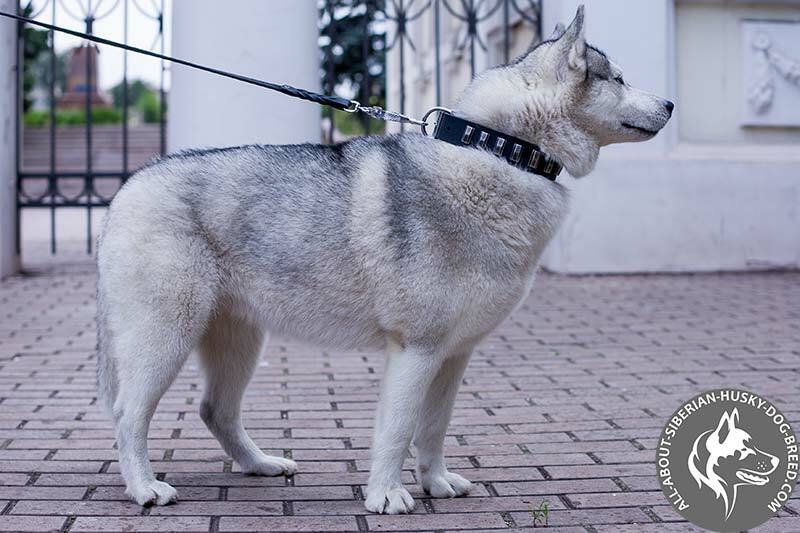 We are sure your Siberian Husky will be satisfied with the equipment you will have chosen for him.